Trying to get out the door in the morning can be brutal. Some days it feels like I’m Katniss in The Hunger Games. Seriously though, the mad dash to get dressed, fed, and out the door is chaos. That’s why these 5 portable paleo breakfasts save me, every single time. Eating a healthy, delicious, and nutritious breakfast does not have to be hard or stupid time consuming. Don’t get me wrong, I’d love a beautiful omelette every morning with all the fixings, paired with a side of seasonal berries and an almond milk latte. But…REALITY. See? Perfectly plated, quiet breakfasts just aren’t happenin’ in this house. 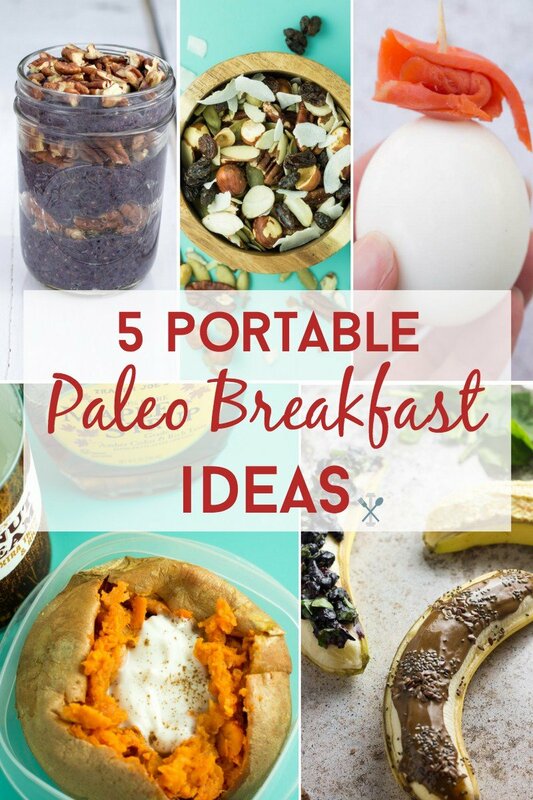 That’s why these 5 Portable Paleo Breakfasts are my lifeline! Wash and pat dry a medium sweet potato. Using a knife or fork, spear punctures all over the sweet potato, then microwave for 5-7 minutes, until center is soft. Carefully (it will be very hot), cut the open the top of the potato and let cool completely. Next, combine one heaping tablespoon of coconut cream (or full fat coconut milk) with 1/4 teaspoon of pure maple syrup and sprinkle in some cinnamon. 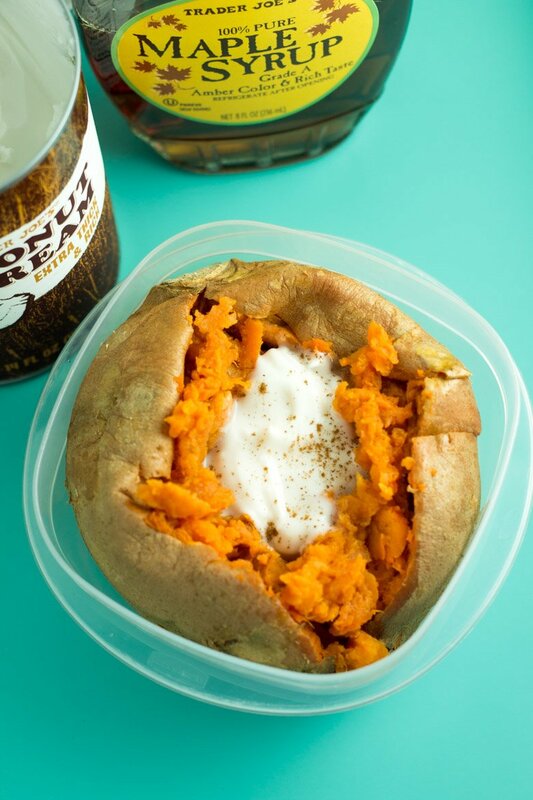 Scoop mixture into the baked sweet potato and store in a container to refrigerate. When ready to eat the next morning, reheat in the microwave and devour. Other option: Drizzle with a mixture of 1 tablespoon tahini, 1/2 teaspoon pure maple syrup, and a little water to thin out the mixture. Remove 1/2 of the skin of a banana, exposing the top and leaving the bottom peel in tact. Top with anything you choose – almond butter with chia and flaxseed, coconut cream and orange zest, or blueberries and spinach. Then refrigerate to let top ‘set’ for portable, grab-and-go eating the next day. 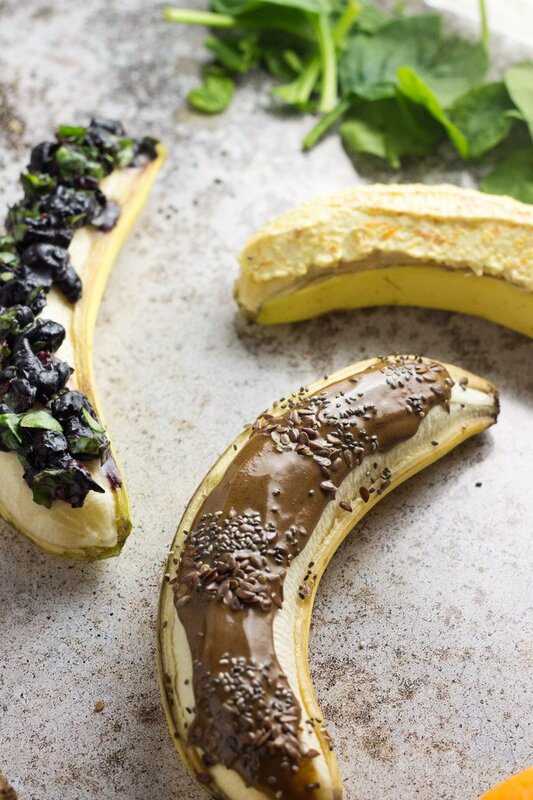 For a complete list of banana boat recipes, click here. 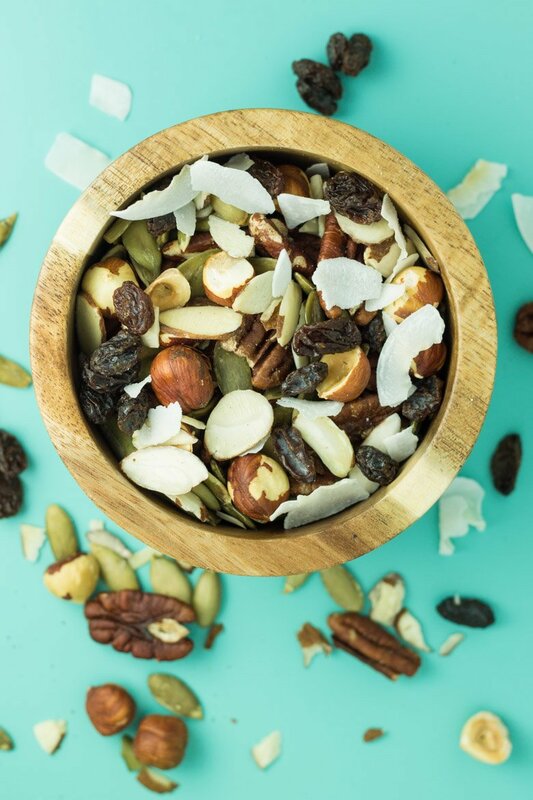 Scour the pantry for any nuts, seeds, dried fruit, and/or coconut chips, thow them together and voila! Eat it by the handful or pour non-dairy milk of choice on top for cereal. Pictured: pecans, hazelnuts, pepitas, sliced almonds, raisins, and coconut chips. 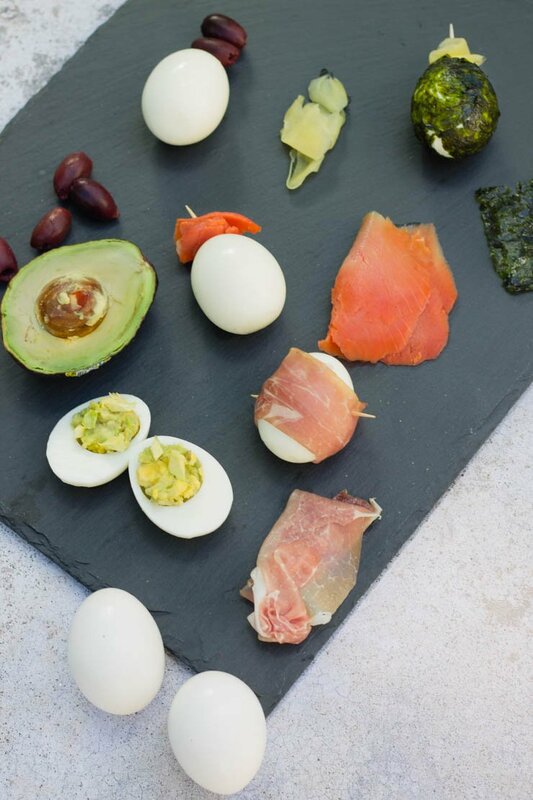 Hard boiled eggs don’t have to be boring. Pair them with things like prosciutto, avocado, kalamata olives, smoked salmon, or dried seaweed and picked ginger. Simply peel the hard boiled egg, add the addition and secure with a toothpick for a quick grab the following day. For details instructions and recipes, click here. 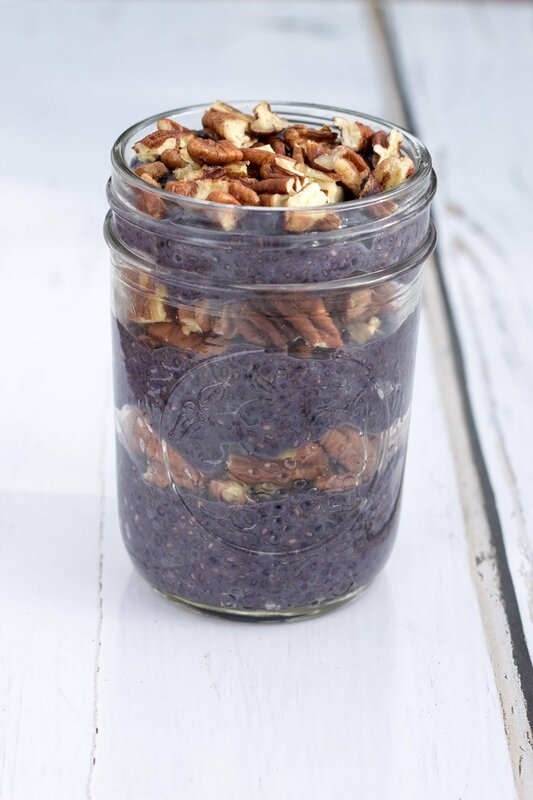 Chia gets a flavor booster with blended blueberries and crunchy pecans. Pour 3/4 cup almond milk into a food processor or blender and add 1/4 cup blueberries (if frozen, thaw), and 2 teaspoons honey. Blend until well combined. Pour liquid into a glass or plastic container and mix in 1/4 cup chia seeds. Refrigerate for at least 2 hours. Once chia seeds have soaked up all the liquid, layer in mason jars with pecan pieces between each layer and sprinkled on top. Egg cups are no new phenomenon, but customizing egg cups can be fun (like these paleo pizza egg cups) and easy to whip up at the beginning of the week and store in the refrigerator to reheat for later. They’re so easy and mess-free, that eating warm eggs while driving to work is actually attainable! 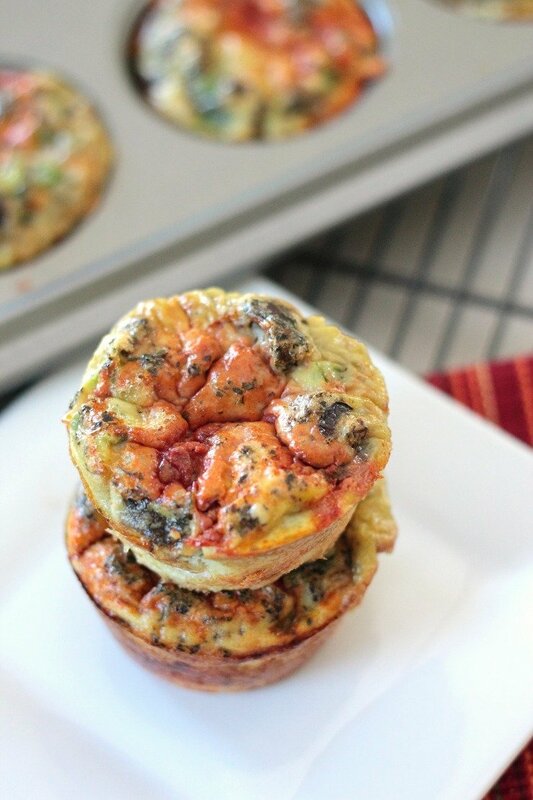 Get the recipe for these paleo pizza egg cups here. A little breakfast treat didn’t hurt anyone. 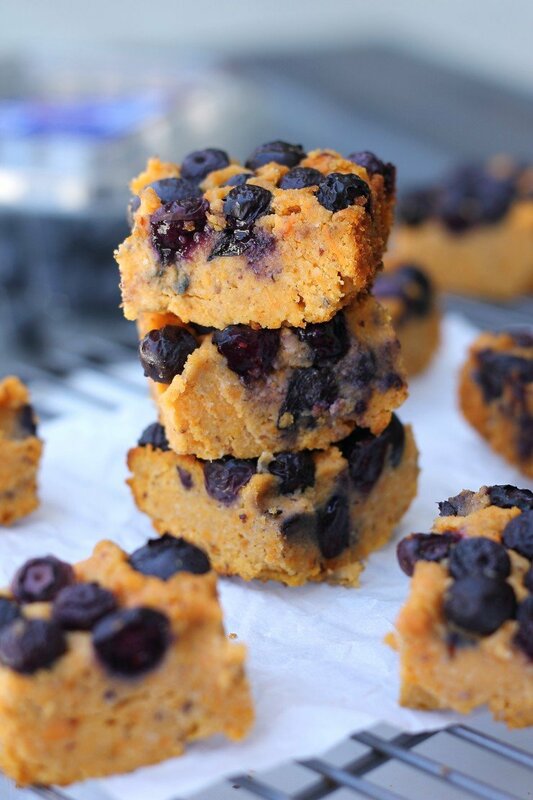 But these nutrient-dense sweet potato bars topped with juicy baked blueberries are a kid and adult pleaser. Snag the recipe here. Cookies in the morning. Done and done. But it sounds so….naughty. 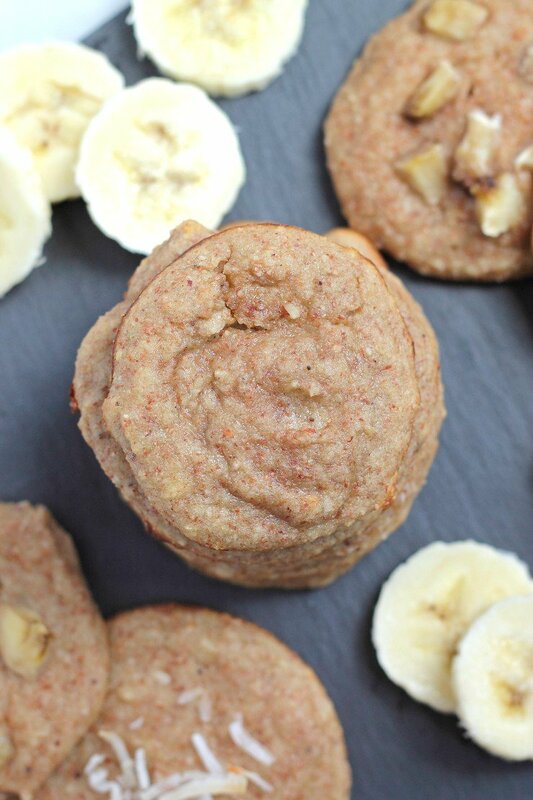 It’s not with these paleo banana cream pie cookies. Made with coconut milk, raw almonds, and sweetened naturally ONLY with bananas, you won’t believe these are actually (secretly) healthy. Find the recipe here. Remember those french toast sticks at Burger King? No? Am I the only one? Something about breakfast in the form of a stick is just too fun. 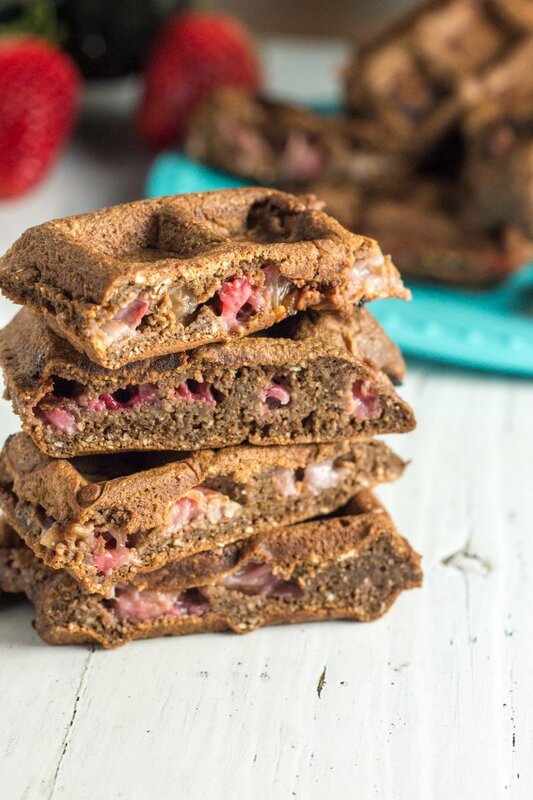 And these gluten free chocolate strawberry waffle sticks are naturally sweetened and definitely a dessert in breakfast form, but still squeaky clean and easy! Find that recipe here. All of these look so yummy! I love the sound of those sweet potato breakfast bars! Also, I tell my kids to put on shoes at least 875,645 times before leaving the house in the morning lol. Whoo hoo get after it busy lady!! So down for all of these! I usually do eggs and nuts/nut butter on the go, but love the sweet potato idea. Totally craving one now! Nut butter is my weakness!!!! Especially slathered on a banana!! You are the queen of that for sure!!! Love you Em! That sounds fantastic Emily! You are the granola queen! All of these look incredible…I remember the first time you posted the sweet potato breakfast bars and I’m over here thinking, why the HECK haven’t I tried those yet? Seriously how do you come up with all this stuff, it’s mind-boggling. Lots of trial and error! But I truly love experimenting in the kitchen, so it’s always awesome when my crazy ideas work out! Thanks girl!